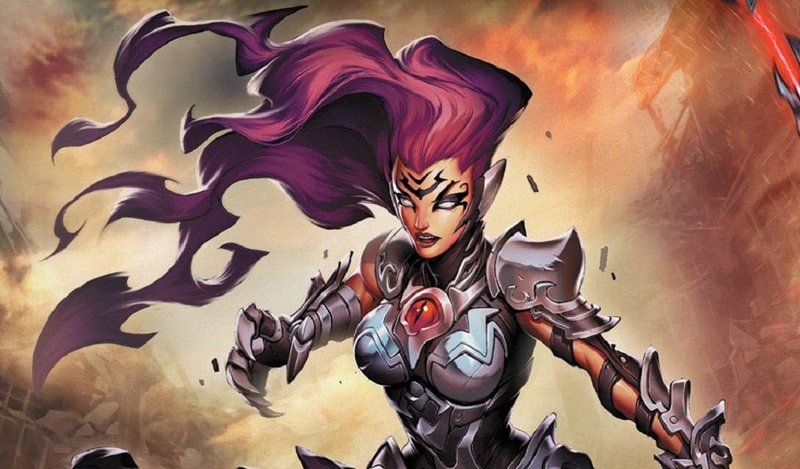 THQ Nordic's recent release Darksiders III may not have quite set cash registers ringing as planned, but at least made a name for itself with it's heavy metal, super-edgy atmosphere and art style. It's a style that the Darksiders series is particularly adept at, all twisted monsters, beefy heroes and spiky shoulder pads. Publisher Udon has collected the artwork of said game in a new hardback tome. The Art of Darksiders III is 208 full-colour pages of concept, interim and final art, featuring our anti-hero Fury, her companions and enemies, as well as the hellish landscapes that she traverses throughout her violent adventure. If that wasn't enough for any budding Darksiders aficionado, then Udon is also re-issuing the long out-of-print Art of Darksiders and Art of Darksiders II books, also in sleek hardback form. Each of these volumes features of 200 page of images, covering the journeys of Fury's buddies War and Death, respectively. The Art of Darksiders reissues on May 7, to be followed by The Art of Darksiders II on June 4 and, finally, The Art of Darksiders III on July 9. Each volume will retail for around $50 USD.